Our DLM 505 – 1205 range of machine is dedicated to high productivity, user-friendliness, economic efficiency, precision and security. Weights ca. 7800 kg approx. ca. 12500 kg approx. ca. 13000 kg approx. Where precision meets throughput rates! Historically fine grinding could not match throughput rates produced by traditional double disc grinding machines. With the invention of the FH3, this is no longer the case! With the improvement of load/unload times, the FH3 can match the throughput rates of a throughfeed double disc grinding machine while still maintaining the tolerances of the DLM models. This will truly be a revolutionary design in the industrial field. 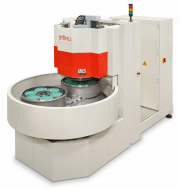 Pioneers of fine grinding process on two-wheel machines are the Duomat and ZL models of the Hahn & Kolb series. They have been advanced by the Stahli group and represent thus a successful synthesis of the combined know-how. In the past over 2000 machines from these series were sold worldwide. The users now are being supported by the Stahli group and benefit from the latest technology. With the new ZL 501 GIII we kept the basic principle of the vibrationless and rigid cast design and made it even more rigid and heavy to consider todays driving power requirements. To pivoted swiveling arm is still supported on a centre beam and the work force is hydraulically applied. Additional improvements and the touch-panel with extended machine functions complete the complete concept. Increased quantities and series production with rapid stock removal require more performance. Our FH 602 machine is dedicated to high productivity, user-friendliness, economic efficiency, precision and safety. Flat Honing with diamond or CBN-wheels opt for a future in super finishing with a newly developed machine from the STAHLI Group. Our single-side Flat Honing Machine with process control and size measuring system as well as loading and unloading tables meet thus requirements.